FuseSource has launched the Beta program for two new Enterprise products its launching today. 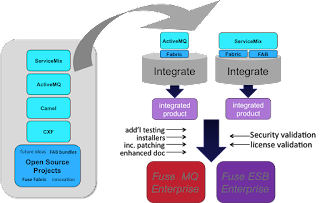 These products, Fuse ESB Enterprise and Fuse MQ Enterprise, provide the capabilities to make integration and messaging even easier to deploy and manage. Central to the new functionality the Enterprise products provide are Apache licensed open source projects that that FuseSource has been working on outside of the Apache Software Foundation, called Fuse Fabric and FAB (Fuse application bundles), which have been designed to work seamlessly with Apache Camel, ActiveMQ, Karaf, CXF and ServiceMix. The Enterprise products are about providing stable, production ready integration platforms for large scale deployments. As well as the additional system and platform testing that goes beyond what we do at the Apache Software Foundation, we also run the products through independent security and license validation, and provide platform installers. For developers, we provide Fuse IDE - Eclipse based tooling for deploying and managing running integration routes based on Enterprise Integration Patterns from Apache Camel. For FuseSource subscribers, we will also be providing incremental patching, and configuration and deployment tooling for the remote management of enterprise deployments (Fuse Management Console) and FuseHQ for operational monitoring. The main project providing the deployment and configuration required for enterprise deployments is Fuse Fabric, which provides a centrally managed distributed configuration, provisioning and runtime registry for services deployed on-premise, in the cloud or both. The main driver for Fabric is that deployments of more than one Apache ServiceMix or ActiveMQ instance can get complex pretty quickly, and FuseSource has customers who deploy with thousands of instances of these projects. So an Enterprise deployment requires a lot of upfront knowledge, and its easy to get wrong. They also require location transparency and the ability to support the failover of endpoints. Fuse Fabric has been developed to solve these problems, and to make the creating interconnected services, clusters and networks of brokers simple. Ioannis Canellos has a nice video demonstration of Fuse Fabric and Camel here. The Fuse Enterprise products utilize the power provided by Fuse Fabric, and key to that is the Fuse Management Console and the new functionality built in to Fuse IDE. 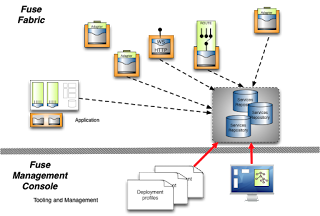 A central part of the Fabric is the deployment container, which can manage and control child containers, and is based on Apache Karaf, which is a small OSGi based runtime and a project which we developed out of Apache ServiceMix. OSGi is great technology for providing modularity and services for Java applications, but it can be difficult to migrate existing applications or create new ones to use OSGi - which is why FuseSource has created Fuse Application Bundles. OSGi is an ideal micro container for the JVM, its small and modular, simple yet powerful. OSGi supports hot (re) deployment of services at runtime and has framework support from blueprint or Spring-dm. However, OSGi bundles ate very fine grained and use package level metadata. To control bundle dependencies requires defining version ranges for every bundle, and typically an application will consist of 10s or even 100s of bundles - thats a lot of packaging and metadata, which often leads to mistakes - and it can be very time consuming to get right. Developers just want to get their applications deployed and working quickly - hence Fuse Application Bundles (FAB). The goal of FAB is to provide a simple way of managing dependencies and class loaders so developers can concentrate on developing value to the business, and avoid learning new ways of dealing with dependencies just for OSGi. FAB enables developers to use a common model of class loaders across build tools, IDE and the OSGi container - how often does code work in the IDE, only to fail when its deployed to an OSGi container? FAB works by using the transitive dependencies all ready defined in an application jar which has been built by maven or sbt. It also enables you to define what to dependencies you wish to share, or you expect to be provided. There's some great examples of using FAB provided with Fuse ESB Enterprise.